Add e-signatures, automate workflows, and hide sensitive content with these tools. 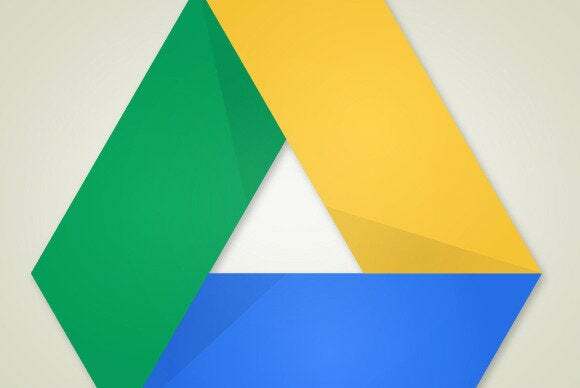 Google Docs has matured into the go-to productivity suite for document collaboration, thanks to an abundance of tools that manage what can easily become a messy process. But even with features like revision history, commenting, and real-time chat, there are a few common collaboration requirements Docs doesn’t yet address. Fortunately, these holes can be filled with some key add-ons. Getting document approvals can be a pain when your colleagues are scattered all over the globe. Virtually chasing down sign-offs via email can become a full-time job with a deadline looming. This add-on creates an automated workflow, shepherding your document through the approval process without having to nag everyone. Workflows automates the document approval processs so you don’t have to chase down reviewers. As the document creator, all you need to do is add team members’ email addresses and a message in the Workflows window of your doc, then click the Request approval button. The first recipient will receive an email asking them to review and approve the document. Once they do, it’s forwarded to the next person, and so on. You can track the whole process within the spreadsheet and receive a notification once it’s complete. Workflows is also available as an add-on for Google Sheets. The signature has long been the one sticking point in the digital workflow, frequently requiring the signer to print out a document at the end of a paper-free process just to add their authorization. Hello Sign’s add-on is the simplest way to avoid this by enabling a legally binding e-signature. 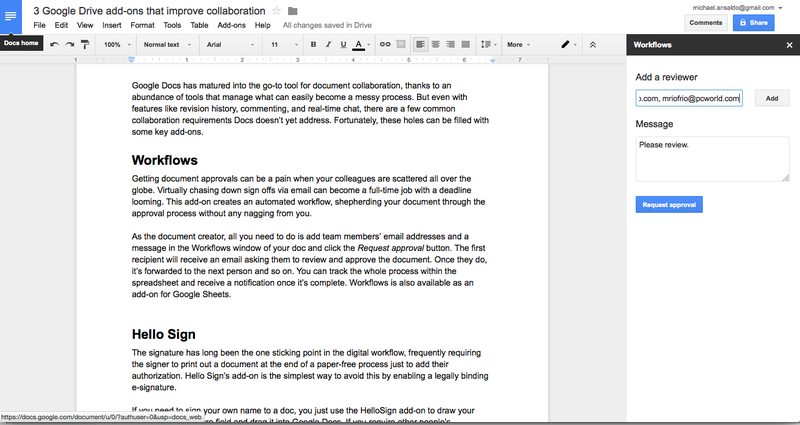 HelloSign adds legally binding e-signatures to your Google Docs. 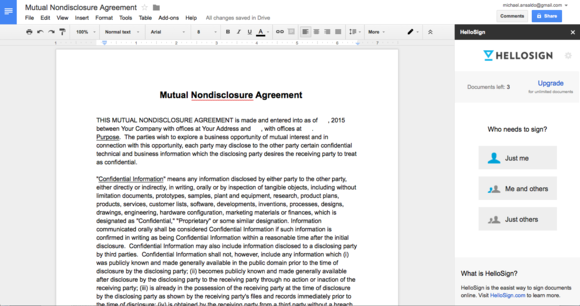 If you need to sign your own name to a doc, you just use the HelloSign add-on to draw your name in the signature field and drag it into Google Docs. If you require other people’s signatures, the add-on takes you to HelloSign’s website, where you can add multiple signature fields to the document and email it to the appropriate parties. The free account allows three documents per month, while HelloSign’s Pro and Business plans allow unlimited documents. Sometimes a document contains sensitive material, such as financial data or trade secrets, that you don't necessarily want other collaborators to see. The DocSecrets add-on gives you a way to hide that content from unauthorized eyes. 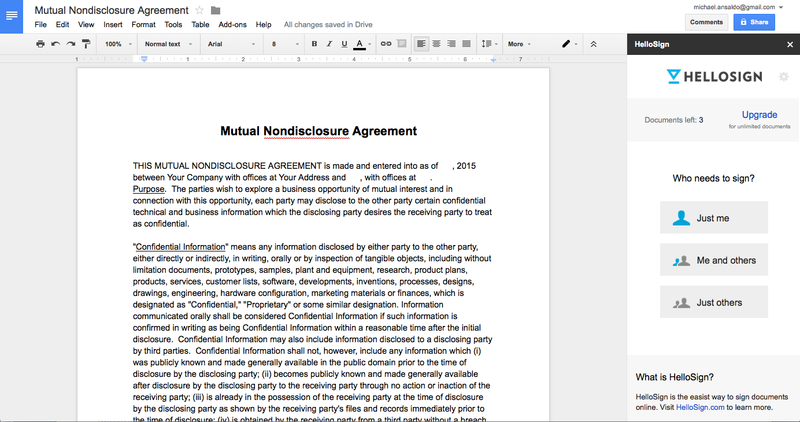 DocSecrets lets you hide sensitive text in collaborative documents. 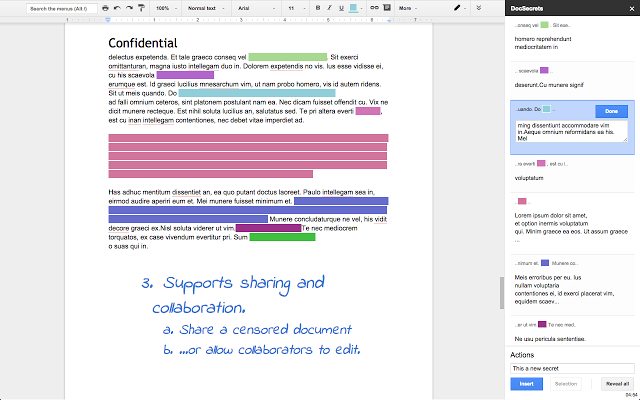 DocSecrets adds a sidebar to Google Docs through which you can insert “secrets” into your documents. You type the information you want to hide in the text field of the DocSecrets sidebar and click Insert. Or, if you want to hide existing text, cut and paste it into the text field and click Censor text. In each case the info will appear blocked out in the doc, protected by AES encryption. Access to the hidden text is tied to a document passphrase, which you can share with collaborators on a need-to-know basis.